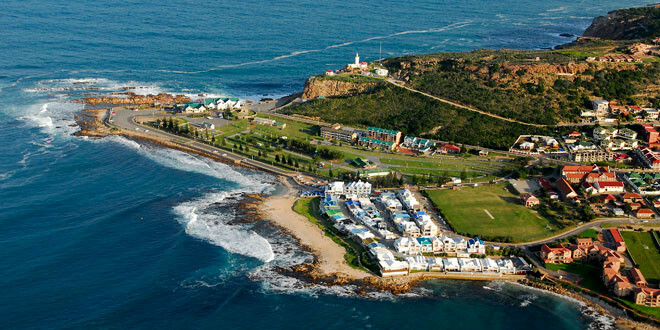 Flanked by the vast azure of the Indian Ocean, the pristine peninsula, and the dramatic rugged faces of the Outeniqua Mountain Range, Mossel Bay remains an important fishing and industrial hotspot, with liberal lashings of history, charm and intrigue. It is close to the towns of George, Knysna, Oudtshoorn and Swellendam, making it an accessible base for explorers. Mossel Bay has a fascinating history as was first discovered by explorers in 1488, when Bartolomeu Dias arrived on the shores. Of course, even then, it had long been inhabited by the indigenous Khoi-San people, who were semi-nomadic hunter-gatherers that lived off the land. Dias named it the Bay of St Blaize. Following the arrival of the European settlers, the town developed around the important harbour that was established here, and Mossel Bay became the base for the export of ostrich feathers, wool and ochre. Later, when the mussels found growing on these rocks formed the basis of the ship crews’ diets, Dutch navigator Paulus van Caerden renamed it Mossel Bay. Today, there are a number of historical attractions that tell the tale of times passed. The Bartolomeu Dias Museum Complex includes many popular must-sees. These are the Maritime Museum, Post Office Tree, Shell Museum and Aquarium, Malay Graves, and Ethno-Botanical Garden. Perusing the relics and examining the old photographs is an awesome way to spend a morning in Mossel Bay. The museum complex is located close to the city centre, and promises lovely views of the bay. Mossel Bay is famous for its marine biodiversity. Whale- and dolphin-watching tours are a fantastic way to see these intelligent mammals within their natural environment. While dolphins can be seen all year round, whales (southern rights, humpbacks and orcas, in particular) only make their appearance in the latter half of the year. Shark cage diving is another popular attraction in Mossel Bay, and those braving the cage can look forward to seeing the mighty great white shark as it hunts for its next meal and explores the steel of the cage inquisitively. Golfers visiting Mossel Bay are sure to be well rewarded. The Mossel Bay Golf Club is rated as one of the top 100 South African golf courses, thanks to the challenging greens and the breath-taking sea views from every hole. The Pinnacle Point Golf Course is defined as a Clifftop Fynbos course, and is about exquisite ocean views and a luxurious course that relents to the natural contours of the land. Watersports like deep-sea fishing, SCUBA diving to see the fish and shipwrecks, boating, and snorkelling are highly recommended along this stretch of the Garden Route. For those with a penchant for archaeology, the Pinnacle Point Caves, Cape St Blaize Trail and the various rock art remnants are fascinating. The Eastern Cape Versus the Western Cape – What’s the Difference?